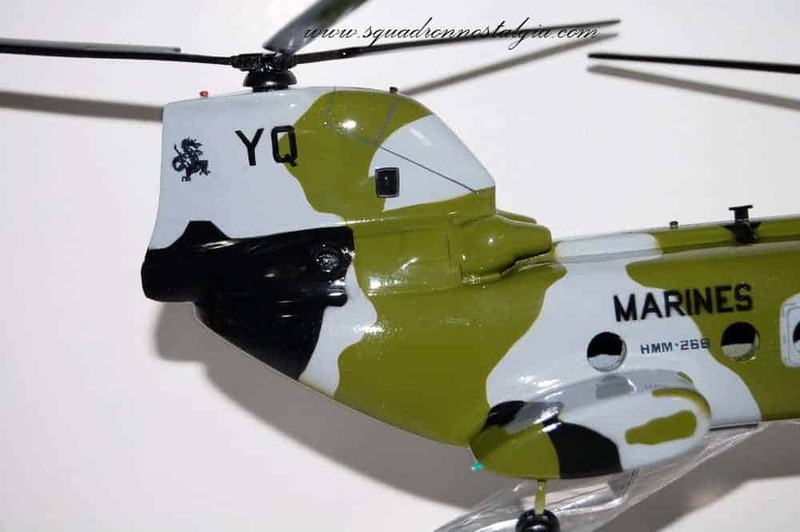 A HMM-268 Red Dragon CH-46 model made from solid wood and meticulously painted to mirror the actual paint scheme of that particular aircraft. Length 16 inches. 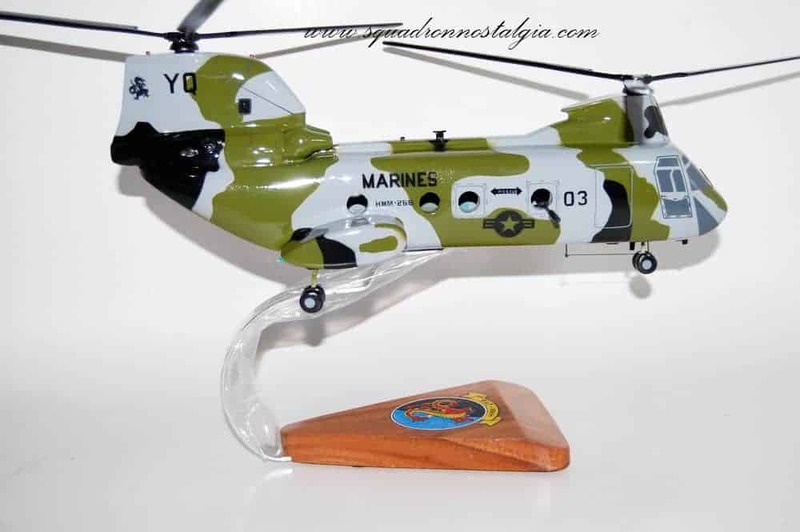 Marine Light Helicopter Squadron 268 (HML-268) was activated on September 15, 1972 at Marine Corps Air Station New River, North Carolina. HML-268 was deactivated on September 30, 1977. 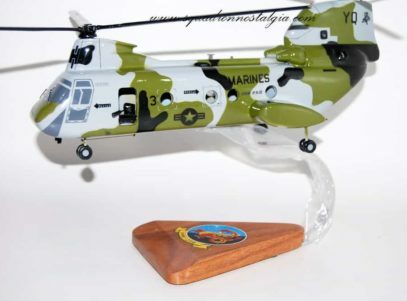 Marine Medium Helicopter Squadron 268 (HMM-268) was activated on March 1, 1979 at Marine Corps Air Station Tustin, California. 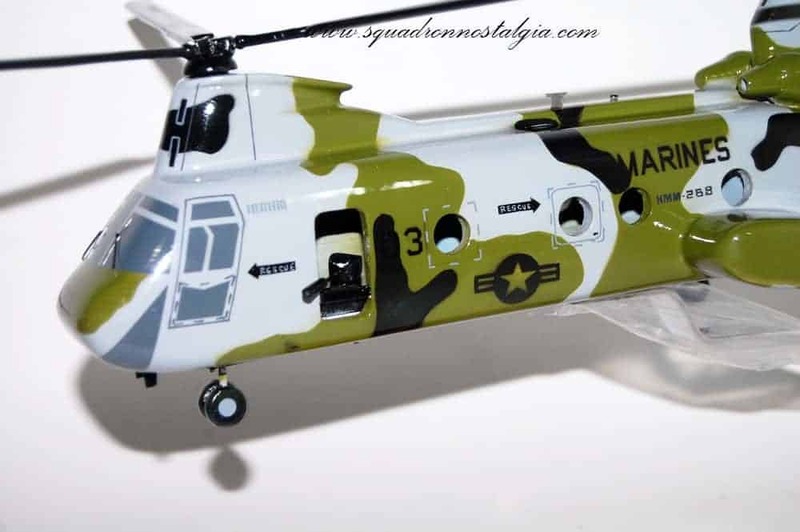 The squadron was designated for medium lift and equipped with CH-46 helicopters. 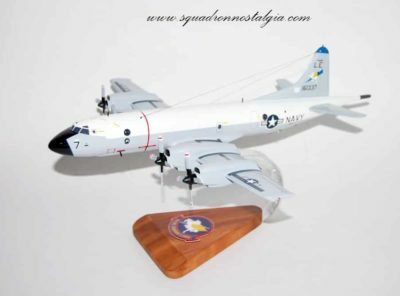 The squadron returned to MCAS Tustin on August 31, 1980. A high tempo of operations was maintained through the 10,000-accident free flight hour milestone, which the squadron attained on September 18, 1981. 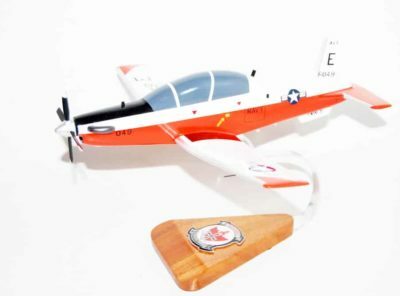 Additionally, during this period, the Red Dragons were the recipients of the Chief of Naval Operations Safety Award for 1981. 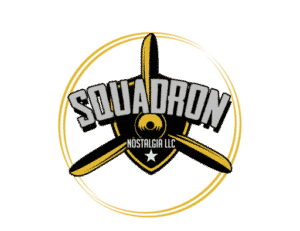 Upon returning to the United States, the squadron was officially designated as the 3rd MAW’s “Night Assault Squadron”. Within 90 days of designation, the “Night Raiders” of HMM-268 implemented an aggressive Night Vision Goggle (NVG) program. 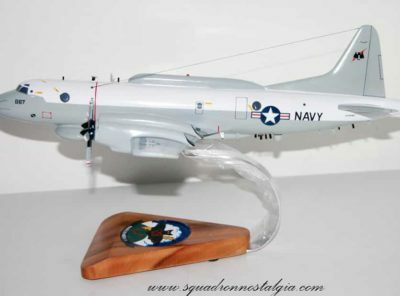 During February 1984 the squadron surpassed the 10,000-hour mishap-free flight hour mark. Between May 1989 and November 1990 the Red Dragons participated in numerous exercises including MAGTF 89-3 deployed aboard the USS Ogden, in support of the Exxon Valdez oil spill cleanup. During this period, HMM-268 passed the 20,000 mishap-free flight hour milestone. On December 1, 1990, while assigned as the Aviation Combat Element of the 11th Marine Expeditionary Unit (11th MEU), HMM-268 responded to the Persian Gulf Crisis. Embarked on the USS New Orleans and deployed with MAG-50, 5th MEB (SOC), the Red Dragons supported Operation Desert Shield. En route to the Persian Gulf, the Red Dragons completed, for the first time ever, the NVG shipboard carrier qualification syllabus. The Dragons also pioneered and flew the first Low Light Level NVG carrier qualifications. 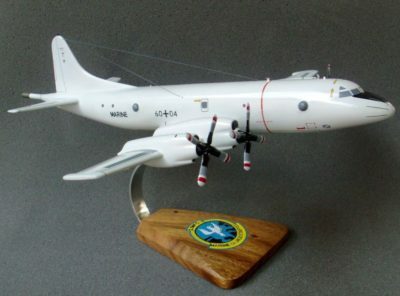 On February 14, 1991, the squadron celebrated its 5-year Class A mishap-free milestone. During Operation Desert Storm, HMM-268 moved ashore and provided combat assault support to 5th MEB, including the “G-Day” tactical insertion of 3rd Battalion, 1st Marines along the Saudi Arabian/Kuwaiti border. The squadron flew over 450 hours in a seven-day period. After conclusion of the conflict, the squadron supported I MEF from Tanajib, Saudi Arabia. In April 1991, the squadron re-embarked aboard the USS New Orleans, as the ACE for the 11th MEU (SOC) and continued its Southwest Asia deployment. The MEU supported National Command Authority objectives in the Persian Gulf, until returning to the United States in August 1991. 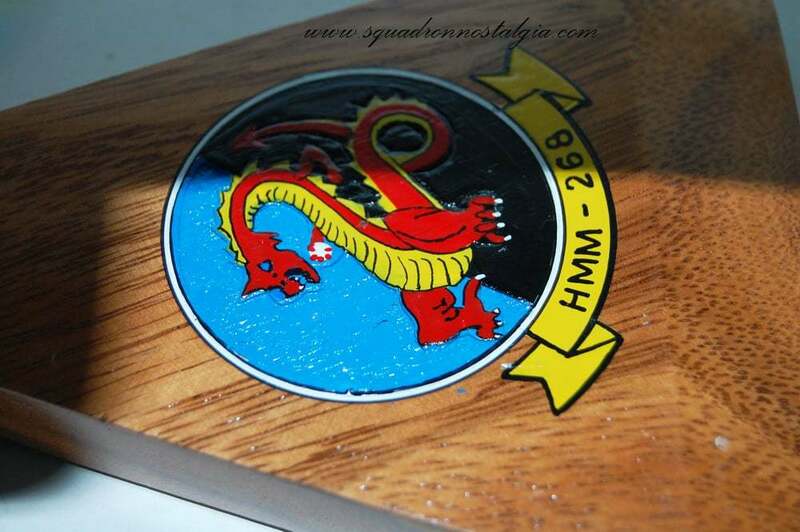 In September 1993, the Red Dragons again deployed to the Western Pacific and were directed to Somalia to support Operation Restore Hope II, in Mogadishu. HMM-268 supported numerous VIP visits, MEU (SOC) and United Nations humanitarian missions. 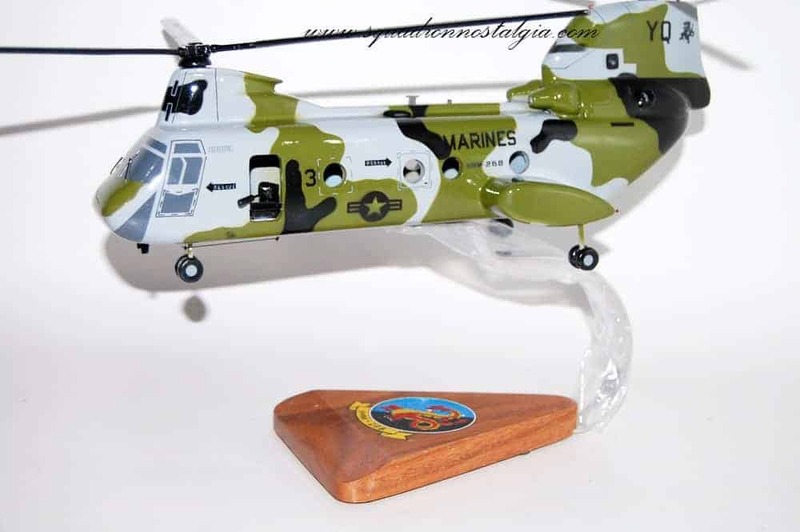 The Squadron returned to California in March 1994, and in July was designated the Marine Corps Aviation Association’s Marine Helicopter Squadron of the year for 1994. 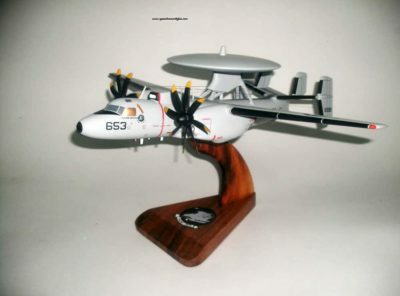 In February 1998, as the ACE for the 11th MEU (SOC), HMM-268 (REIN) was tasked to deploy ahead of schedule in response to Iraq’s disregard of United Nations decree. The squadron took part in Operation Southern Watch and Operation Safe Departure, in which over 170 American citizens were evacuated from war torn Eritrea. 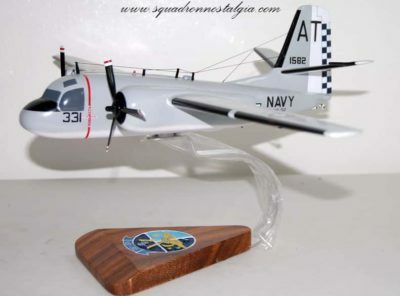 During this deployment, HMM-268 received its fourth consecutive Chief of Naval Operations Safety Award. The squadron returned from this deployment on 6 August 1998. 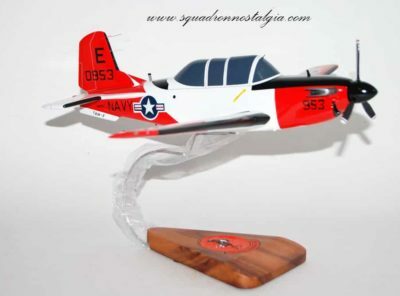 The Red Dragons moved from Marine Corps Air Station El Toro to Marine Corps Air Station Camp Pendleton in February 1999, and departed on 14 March 2001 as MAG-39’s first Air Combat Element (ACE) for the 11th MEU (SOC). The squadron supported Humanitarian Operations in East Timor lifting several hundred tons of needed goods to the people of East Timor. In January 2003, HMM-268 began the long process of deployment to Kuwait in support of Operation Iraqi Freedom. The Red Dragons distinguished themselves by their tireless support for combat and Casualty Evacuation CASEVAC operations throughout the area of operations, returning September 19, 2003. In August 2004, HMM-268 deployed again to Iraq in support of Operation Iraqi Freedom II. For seven months the Red Dragons provided CASEVAC support for I MEF units engaged in combat, returning home in March 2005. 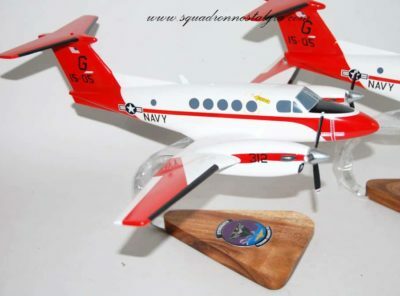 The Red Dragons are the Chief of Naval Operations Safety Award winners for 2004. The award signifies commitment to aviation safety, professionalism, solid leadership, and effective operations and readiness. The squadron redeployed to Iraq in early 2006, and from February 25, were responsible for casualty evacuation and assault support in the area around Al Taqaddum Airfield where they were based. On June 28, 2008, HMM-268 deployed to Naval Air Station Lemoore after California Governor Arnold Schwarzenegger requested military assistance to fight raging wildfires. 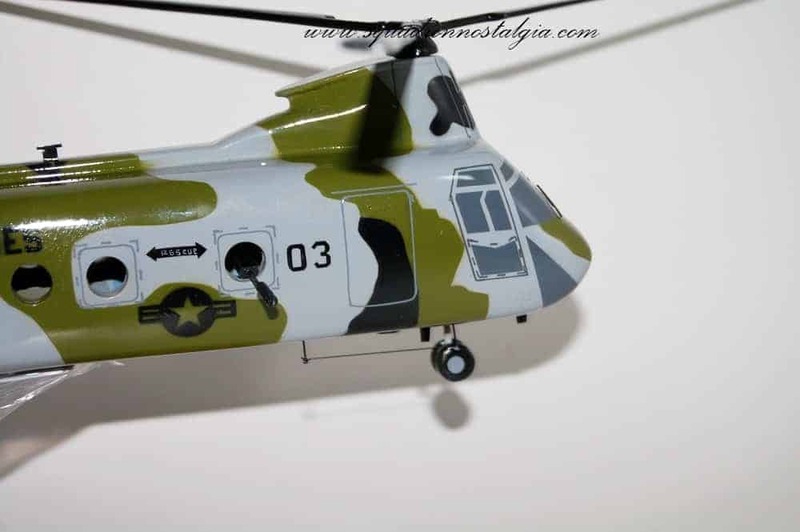 The helicopters provided medium lift rotary wing support to United States Northern Command and the National Fire Center. In March 2009 the Squadron again deployed to Iraq in support of II MAW FWD operations for stabilization of Anbar Provence. In November 2011, HMM-268(REIN) embarked for its first shipboard deployment in over a decade aboard the USS Makin Island and USS New Orleans as the ACE for the 11th Marine Expeditionary Unit. While deployed, the Red Dragons participated in seven Theater Security Cooperation (TSC) exercises in Cambodia, Singapore, Malaysia, Kuwait, Saudi Arabia and Oman, as well as supported several national tasking missions. Upon return from the MEU deployment, HMM-268 was designated to transition from the CH-46E to the MV-22B Osprey. This marked the beginning of a new chapter in the Red Dragons’ history as the squadron continued to maintain readiness while preparing for transition. VMM-268 deployed to Southwest Asia as part of the Aviation Combat Element of Special Purpose Marine Air-Ground Task Force Crisis Response Central Command 16.1 in the continuing fight against Islamic State in Iraq and the Levant.